I've been smiling all afternoon because of an article in today's Australian newspaper by new member of Federal Parliament Alannah MacTiernan entitled "Post modern clap trap rules in schools". "It is a scandal that Australian education is being held to ransom by a few hundred academics and mid-ranking bureaucrats who prioritise their own careers over the literacy of our children". "Quite simply, the academic institutions and state educational departments are largely controlled or influenced by those with career attachments to the "whole language" methodology. "It focuses on reading being acquired naturally, as with speech, rather than being taught systematically as a code to unlock sounds and structures. Phonics is not given the central focus and children are encouraged to guess words based on the context or pictorial clues. "While there are students who can learn to read in this way, many do not. It is an approach that particularly fails kids from lower socio-economic and Aboriginal backgrounds. It also appears to disadvantage boys." She tells the story of a cluster of primary schools in which she's involved in a disadvantaged area on the outskirts of Perth. They had poor literacy results, but turned them around using a vigorous phonics program. I won't paraphrase the article further, but urge you to read the whole thing yourself, by clicking here. I hope it doesn't disappear behind a paywall before you get a chance. "To me, it is immoral to allow so many Australian children to be victims of a failed educational fad. We are not just failing to teach these kids to read – we are destroying their confidence as learners. We teach them to hate school. "We are also setting up this country to be a loser in the globally competitive market. "It is time for federal intervention. The states have shown an inability to address this problem. Securing our future as a clever country depends on it." I was already an Alannah MacTiernan fan because I'm involved in the Trains Not Toll Roads campaign, which invited her to speak at a public meeting here in inner Melbourne a few months ago. The featured image for this blog post is from the video of that talk, click here if you want to watch the whole 23 minutes, she makes complete sense on transport and planning too. 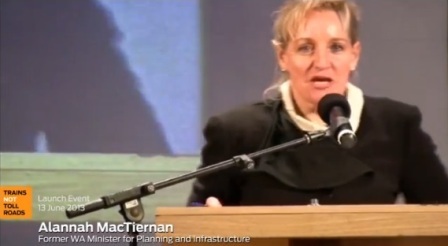 Although she's new to the Federal Parliament, MacTiernan is not new to politics – she was the Western Australian Transport Minister who built the Mandurah rail line, which whizzes down the middle of a freeway at 130kph, overtaking the cars, and has been a huge success. Let's hope MacTiernan can persuade her colleagues about phonics, and help inspire and lead the revolution in early literacy education we need. This entry was posted in curricula, literacy problems on October 24, 2013 by alison.